Helsinki is the capital of Finland and it has become an international city that still holds on to the small town atmosphere. Most people prefer to visit Helsinki in the summer when the weather is a bit warmer and there are many great outdoor bars and cafes where you can hang out. If you're visiting during the winter months, you'll find that some accommodation shuts down for the season. Still, there are a decent number of options around town and some good deals to be found. As a general rule, Helsinki is a very expensive city to visit. The quality of accommodation is usually good, but the prices are high as well. Weekends may be slightly cheaper because there are less business travelers, but you should expect to pay a good amount for a room regardless. 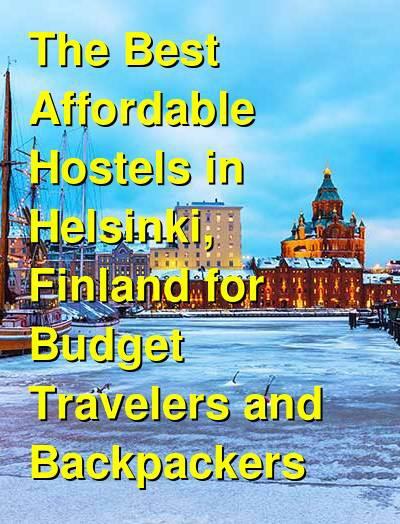 How much do hostels in Helsinki cost? What are the best quiet, safe, and affordable hostels in Helsinki? A good hostel for backpackers, solo travelers, and female travelers. Hostel Diana Park is a favorite hostel in Helsinki for budget travelers and backpackers. It's a small and cozy place to stay and it's located right in the heart of the city. It's open year around, so regardless of the season, this is a reliable and welcoming place to stay. The hostel is centrally located and is in a neighborhood with a lot of bars and shops. The staff are available 24 hours a day and there are all of the standard amenities available including free internet access, security lockers, and a common room. This is a relatively small hostel with only 15 rooms in total. The dorms sleep four, five, six, or eight people and there are both co-ed rooms and female only rooms to choose from. If you're looking for a quiet, affordable, and reliable place to stay, then Hostel Diana Park is a good option. A good hotel for solo travelers, couples, and small groups. Hotel Anna is actually a hotel, not a hostel, but it's affordable and centrally located and makes a good option for budget travelers. The hotel has a wide variety of private rooms to choose from including single, twin, and three or four bed rooms. Regardless of the size of your group, this is a good option. It's centrally located and is near many great sights and attractions around the city. The hotel appeals to a wide variety of travelers including independent travelers, business travelers, and vacationers. Nearby you'll find many great restaurants, pubs, and shops, and public transportation is also easily accessible. The hotel has 64 rooms in total and each room has access to wi-fi. Guests can enjoy breakfast at the restaurant every morning and there is an on-site sauna and a small conference room that holds up to twelve people. If you've arrived with a private vehicle, there's a parking garage nearby. A good hostel for backpackers, solo travelers, and budget travelers. SweetDream Guesthouse is another comfortable and relaxing place to stay a bit outside of the city center. It's near many different types of public transportation including bus stops, tram stops, and metro stations. With public transportation it's easy to access almost any part of the city and the city center is about five minutes away. There's also a supermarket nearby if you want to cook your own meals or an on-site restaurant if you prefer someone else do the cooking. SweetDream Guesthouse has all of the standard amenities available. There's free wi-fi available, a full kitchen, an on-site sauna, and friendly staff that can help you with any questions you might have. The hostel has dorms that sleep four, six, and eight people. If you don't mind being a little outside of the city center, then this is a good option for budget travelers. A good hostel for backpackers, couples, and small groups of travellers. Eurohostel is probably one of the most popular hostels in Helsinki, Finland. It's conveniently located near the city center and is also near the tram. You can walk to a wide variety of restaurants and shops in the city center. It's in an area called Katajanokka, that is close to the Market Square. It's also just a short walk from the passenger ferry. Eurohostel is a larger hostel. It's popular because of its large number of rooms, central location, and the fact that it's open year around. There are 135 rooms with a total of 255 beds spread across five floors. The rooms are defined as either budget class backpacker rooms or modernized Eurohostel rooms. The Eurohostel rooms each have an international television and modern furnishings. The hostel has an on-site restaurant that serves breakfast and basic meals throughout the day. There's also luggage storage, laundry facilities, and internet access throughout the hostel.